One of Houdini’s first and rarest pitchbooks, Mein Training und meine Tricks, published in Germany in 1909, is up for auction on eBay with a starting price of $1000. What makes this copy extra special is the fact that it’s signed by Houdini on the cover. An unsigned copy of this book sold at Egyptian Hall Museum Auction in 2000 for $3500. The book is 77+ pages with 21 pictures. The auction ends on March 25 at 21:38:58 PST. 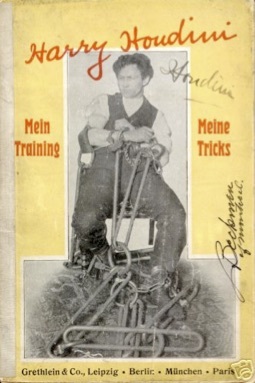 Mein Training und meine Tricks contains some spectacular early photos of Houdini during his heyday as “the Handcuff King”. While Houdini was a headliner throughout Europe, nowhere was he more popular than in Germany. 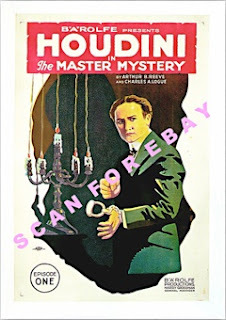 A beautiful original poster for Episode One of Houdini’s 1918 silent movie serial, The Mastery Mystery, is currently up for auction on eBay with a starting price of $34,000. According to the seller, this poster was displayed at the Strand Theater in Allentown Pennsylvania where his father “begged it” from the manager. The poster is linen backed and in almost new condition. There is believed to be only one other Episode One poster in existence. This is not the first appearance of the Allentown Episode One poster on eBay. This same online auction has cycled several times without any bidders. While the starting price is certainly high, the seller points out that a more common Episode Eight poster (in lessor condition) sold at a Christies auction in 1997 for $27,600. Posters for Houdini’s silent movies outsell his theatrical posters by wide margins. Recently, an original Buried Alive 8-sheet failed to attract an eBay buyer at a starting price of $11,000. However, a King of Cards poster did sell on eBay recently for $14,000.